There’s much similarity between the first two seasons of Voyager. Perhaps that’s largely due to the fact that the first few episodes were actually carry overs from the first season. 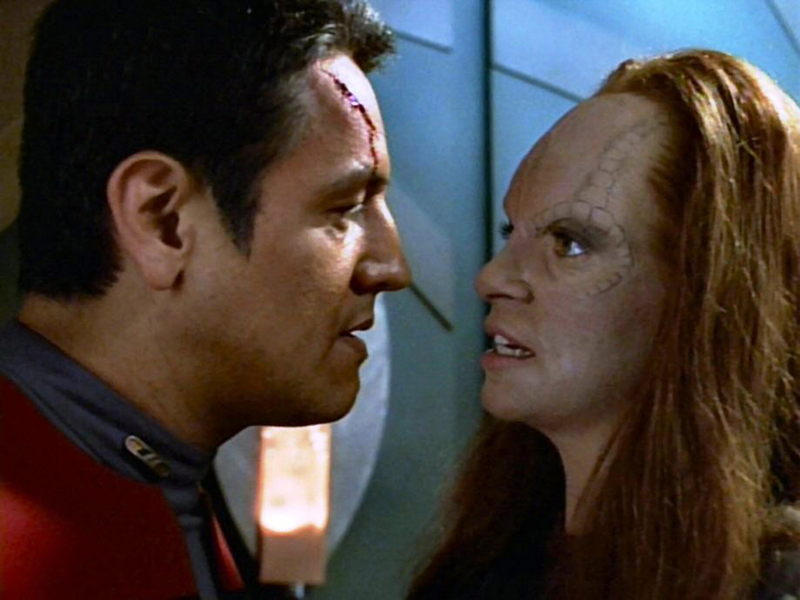 In a bold attempt to serialize the plot, the Kazon story arc – particularly with regard to Maje Culuh and mistress Seska – is heavily featured during the season, leading to the season’s cliffhanger finale. On a planet in the midst of a resistance, an estranged man believes Janeway is his long-lost daughter. B'Elanna is abducted by a ship of sentient androids and forced to construct new units. Voyager holds a conference to align the Kazon sects. Upon breaking the Warp 10 barrier, Tom Paris transforms into a new being. Torres tries to stop a rogue Cardassian missile before it destroys an inhabited planet. The Doctor falls in love with his patient, a Vidiian woman. Neelix investigates a potential spy aboard Voyager. Two separate Voyagers overlap in two universes… only one of which can survive. Tuvok is stranded with a group of scared children – who may be older than perceived. Voyager works to save a group of aliens from stasis when a dangerous computer infection threatens all of their lives. The Kazon-Nistrim overtake Voyager, stranding the crew on a primitive planet.